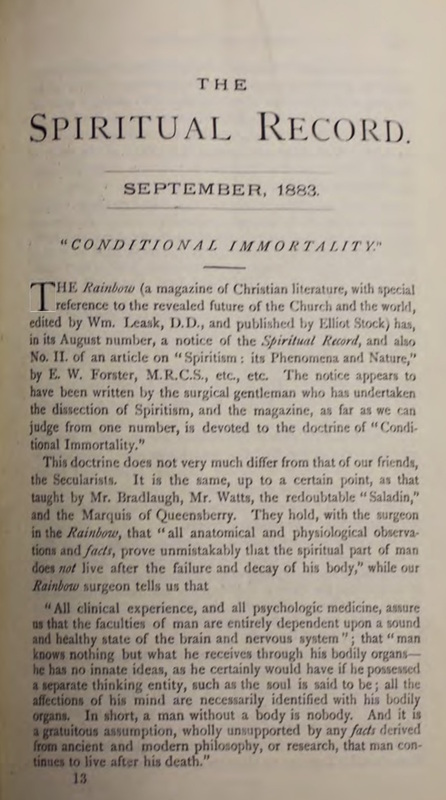 A Monthly Magazine of Facts and Phenomena relating to Spiritualism. Glasgow, Scotland, and London, England. Publisher: Hay Nisbet & Co. (Glasgow) and Edward W. Allen (London). 1/1, June 1883-2/14, June 1884 (?). Mind and Matter, May 19, 1883, calls it "a sixpenny magazine of 64 pages octavo." Illustrated with direct spirit drawings. Nisbet was a printer and sometime president of the Glasgow Association of Spiritualists. He was connected with the development of the spirit artist David Duguid in 1865 (when his writing-medium daughter placed her hand on Duguid’s and he began to draw under spirit influence), and later was the amanuensis for Duguid’s Hafed, Prince of Persia and other books. Nisbet also published works by T.L. and Mary Gove Nichols. LOC; University of Texas, Austin; NSAC, Lily Dale; BL.